This month has been a very busy one for my family and me. I looked at my calendar today and realized that the month is already almost over! I have so many blogs on my mind, but have not been able to make the time to sit and type. At the beginning of the year, I started a candy buffet business. It was a little slower to start than I had anticipated, but these last two months have been busy for me. I launched my website back in February. Although it was functional, I had a difficult time really liking it. The colors were pretty bland and my forms were glitchy at times. 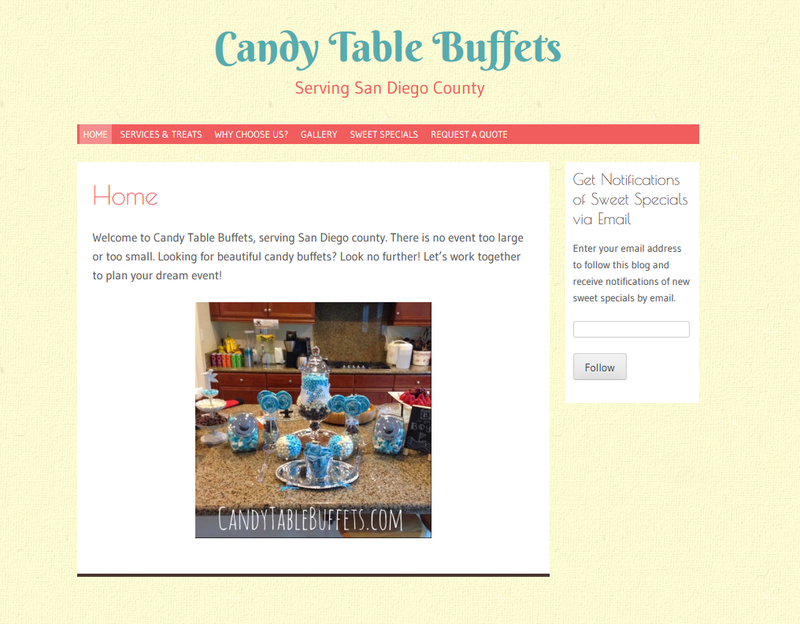 I have spent a great deal of time this month re-vamping my site and changing hosts. I love my blog being here on Blogger, but I realized that I didn't have the freedom that I thought I would have creating a company website on blogger. I wasn't able to make my blog page anything other than the main page and without using a third party app, I could not post pictures into gallery format using thumbnails. Last week, after tinkering with my site a little more and a failed (hideous) Picasa slideshow experiment, I finally had enough and decided to start anew on WordPress. This blog initially started as a WP blog, but many of the functions I needed were pay for use functions, so I quickly migrated to Blogger. This time around, in terms of a company site, WP is exactly what I was looking for! The forms are integrated into WP, so I no longer need third party scripts for that, they have beautiful media integration for my photo gallery (now I need to get everything uploaded that I want on there). It is fabulous! The only complaint that I can make is that the free themes are really not customizable unless I want to spend money to unlock features (remember, this is why I switched my blog to Blogger). Perhaps in the future I will opt for WP premium, but as a starting business, I want to move from "red" to profit as soon as possible. If going for an inexpensive option is important to you, Blogger is a great place to start for blogging, but if you are looking for a website that has a blog but has versatility for much more, give WordPress a try! Which blogging host do you prefer and why?